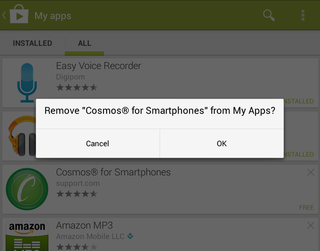 One of the new features in Android's updated Play Store app is the ability to delete apps from your download history — something that was impossible before. UPDATE: corinne mentions this feature was available in previous versions of the Play Store app, so you may not need to update to the newest version after all. Pretty sure I could do this in the last version of the Play Store as well. To delete an app, go to the "My apps" section in the Play Store and tap the "ALL" tab. Any app that can be deleted will have a small 'x' in the upper right corner of the entry. Tap on that and confirm you want to delete the app to remove it from your history. Don't have the new Play Store on your android device yet? Droid Life has instructions on how to get the new version here.